Sept. 15 kicked-off Hispanic Heritage month with a celebration and turning the Downtown Canal orange. 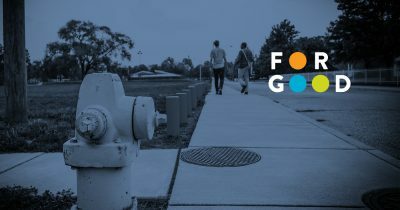 More than 50 percent of Spanish-speaking people living in Indianapolis are under the age of 24, so this month’s episode of For Good, is all about Latino youth. Maria de Leon, a CICF community ambassador, talks about what she learned from her peers and shares her own story, while an undocumented college student shares his plans to give back to the community. The episode also features Miriam Acevedo Davis, president and CEO at La Plaza, and Yecenia Tostado, former senior program director at Indiana Latino Institute. Welcome to For Good, Central Indiana Community Foundation’s podcast highlighting stories about passion, purpose, and progress in central Indiana. At CICF, we believe in opportunity and equity. We believe that our communities and neighborhoods are stronger because of our diversity. And we believe that with innovation and boldness, central Indiana can be a place where everyone can reach their full potential, no matter their place, race, or identity. This is our community. And these are your stories. September 15th kicked off Hispanic Heritage Month. It’s a celebration of the rich culture, heritage, diversity, and achievements of descendants of Spanish speaking cultures, including some one hundred thousand living in Indianapolis. More than 50 percent of those residents are under the age of 24 and they are charting a path of possibilities and promise in America. I’m Angela Cain with a special episode of “For Good.” What is life like here for Latino and Hispanic youth? Especially at a time when the nation is facing cultural and political change. MARIA DE LEON: I feel like there are a lot of opportunities here for the Hispanic and the Latino community. I think that it’s a city where people can just grow from anything. This is the hope of youth. Encapsulated in the word of Maria de Leon, a CICF community ambassador for Latino youth and she has words of wisdom beyond her 18 years, urging us to embrace the diversity of Indianapolis, the city in which she was born and raised. MARIA: We’re just like everyone else. I always questioned why some people have to view society within color, within race and ethnicity. Sometimes I just don’t really understand. We should just accept how everyone is. Just find a way for all of us to come together and celebrate our diversity. Maria’s parents immigrated here from Guatemala to build a more promising future for their family. Like many Latino youth, Maria is motivated to honor her parents’ brave journey to a new land. MARIA: I would say that our parents made that decision to have a better life and so now we are making our own decisions that we want a better life as well and that means that we want the opportunity to work and we want the opportunity to be a part of the community. And many Latino youth want the opportunity to get a postsecondary education. Maria is a freshman at Butler University on a full tuition scholarship. She also has a job, she leads community service projects, and she’s involved with some not for profit organizations. Maria found support at the Indiana Latino Institute, a local not for profit that serves Latino students. YECENIA TOSTADO: Our mission is to improve health and advance education for the Indiana Latino community. Yecenia Tostado is the Senior Program Director at the Indiana Latino Institute. It’s educational services include college coaching, internships, work study programs, and scholarships. YECENIA: We work with students, starting when they’re in high school all the way through undergraduate, as well as when they enter the workforce. Yecenia says many Latino college students choose majors that they relate to personally. YECENIA: We see a lot of students interested in areas of medicine and pursuing the opportunity to be a lawyer or an attorney, specifically with immigration law and I think a lot of the reason that those careers resonate with our population is because they relate to people who need that service. So they see a great need to provide the service for the community. Very much a servant leadership type of mentality where they want to do something that helps uplift their community. However, Yecenia notes that many Latino youth have not been exposed to a higher education. They have hard working parents but few are college educated. YECENIA: The majority of them are first generation college students because of the education attainment of their parents. A college degree does increase the likelihood that you will be able to obtain a better job, a better paying job. That you’ll be able to provide for your family. That you’ll break a cycle of poverty. That your children will go to college. But Maria, a first generation college student with three younger siblings still at home, says there are many barriers for Latino youth to take their education to the next level. MARIA: I had parents with a language barrier and limited education. My parents weren’t able to tell me how college would be like what I should do during high school to receive a scholarship or to prepare for college. So I took it upon myself to find those resources and I think that not a lot of students may find that easy to do. And Yecenia says Latino youth also face cultural barriers that can interfere with college. Since commitment to family is everything for Latinos, college sometimes take a back seat. YECENIA: The family expectations on the child can be very great. There is an expectation for children to contribute to the household. There sometimes isn’t a lot of support for pursuing higher education because of the expectation to contribute to the household. So parents may want their child to immediately after graduating high school or as soon as they can obtain a job. MIRIAM ACEVEDO DAVIS: Families also help their families back in their countries of origin. Miriam Acevedo Davis is the Executive Director of La Plaza. MIRIAM: It’s a not-for-profit organization that serves Latino youth and their families. Miriam says financial barriers often disrupt college pursuits. As we all know, particularly for first generation low-income kids, sometimes you have a choice of my car tires are without tread, do I pay for my tires or do I pay for my books. And today political barriers are on the rise for Latino high school and college students as the Trump administration changes the rules on immigration. MIRIAM: Your biggest fear is if my dad leaves work and gets stopped so he gets deported and he’s the breadwinner and so if my dad is gone, do I have to drop out of school to go help my mom and two younger siblings? La Plaza focuses on helping students succeed in high school and helps guide them into college. MIRIAM: Some of our kids are undocumented, which means they’re not able to get financial aid in some form which makes it that much more difficult for them to access financial aid to complete their education. Leo is an undocumented college sophomore in Indianapolis, originally from Mexico. LEO: At five years old, I came here with my mom and dad. They brought me here for just a better opportunity overall for a family. We’ve been given so much, so many opportunities here, and all we wanna do is really just give back to everyone. My major right now is biology. I’m hoping to go to med school and I’d love to be a child psychiatrist. Leo has protection from deportation for now because of the deferred action for childhood arrivals policy or DACA. But he worries about what the future holds for his renewable status. LEO: Every DACA student or undocumented individual always has the certain fear of what happens if I get pulled over or what happens if it’s like I immediately get deported. Everyone who’s contributed in the slightest way to my education, they have all been from Indiana, so this is my home and for someone to tell me to go home it’s like well, I’m already here. I’m not sure what you mean by that when the only home I’ve known is this. Yecenia Tostado says anxiety and depression are on the rise among Latino youth of all ages. It’s triggered by stress over the potential break up of some of their families. YECENIA: Imagine being two years old or imagine being five years old or even ten years old or twelve or fifteen and being separated from your parents. I mean what would that do to a child? What would that do to their mental health? What would that do to their physical health? This idea that children should be punished is just inhumane. And yet nothing can diminish the hope of youth. MARIA: I think we’re becoming stronger and we’re uniting more and trying to plan out on how to defeat this problem and there are even allies coming together and uniting with us as well. We definitely do feel hopefully because we see that opportunities are being created on how we can become involved. Miriam and Yecenia support all youth and they want the community to see who Latino youth and adults really are. They say most Latinos are here legally and they should not be stereotyped. YECENIA: Historically we’ve always welcome immigrants to this country and Latino families are no different than the Italian families that came here from the English families that came here, the Swedish families. MIRIAM: Latino culture is a very warm, friendly culture. Our people are beautiful people inside and out. We’re very open, we’re hard workers, we are here because we truly want the best for our families and we truly want to contribute to society. We have a great economic impact here in society. We are very entrepreneurial so a lot of Latinos are creative and start their own business and I think being able to have genuine interactions with people and be able to break down some of their misperceptions is really what will change perceptions what will change the world. And despite their challenges, perhaps the most likely to change the world are our community’s youth. Latino youth are creating their own path in the land of the free as they learn to be brave. YECENIA: You see a real commitment to social justice, to equity, to wanting to work together, to wanting to make a difference. They’re fearless. They wanna go in and talk to the politicians and they aren’t scared. Maria, just beginning college, already has aspirations to be a game changer in her community. MARIA: My major is Peace and Conflict studies. I chose that major because in the future I either want to be a politician or I want to become President and CEO of a non-profit organization that has a mission to empower youth. And Maria says Latino youth want more inspirations leaders and mentors, more unity among their diverse population, and more inclusiveness in the whole community, with no fear of raising their voices. MARIA: We are advocates and we are educating our own family, our own peers and friends. YECENIA: Truly, when you look at the kids and how they’re willing to band together and support each other and let their voices be heard, wow. Yeah. An old timer like me I’m like oh, the community’s in good hands as we have kids like that out there. At age 18, Maria fully understands the power of her voice and the vote she will cast in November. She knows what it means for her personal future and for her Latino family. MARIA: I feel like the movement is participating in protests, participating in going to vote, educating your own peers on how they can engage if you are already engaged, and also being an ally for other minorities as well. Nothing can stop us because we know what we want, we want to reach out goals and dreams. We’re the future and we’re the people who will one day be representing you. We want to become professionals as well and be a change for this community. We want to make our society better by accepting everyone who is a part of this nation. I’m Angela Cain, and I hope you’ve enjoyed this special episode of For Good. We are Central Indiana Community Foundation and you’ve been listening to For Good. If you liked what you heard today, we hope you’ll subscribe to For Good on your favorite podcast app. And while you’re there, don’t forget to leave us a review. Join us next month for more stories about passion, purpose, and progress in Central Indiana. For Good is brought to you by Central Indiana Community Foundation in partnership with WFYI Public Media.